He isolated DNA from Egyptian mummies. He discovered the Denisovans, an extinct ancient human species, by sequencing DNA from a tiny bone fragment. He led a massive study that reconstructed the Neanderthal genome—and found traces of their genes still lurking within some of us today. Now, the Swedish geneticist Dr. Svante Pääbo is once again ready to turn paleontology on its head—this time, by growing “Neanderthalized” human stem cells into tiny brain organoids inside a dish. 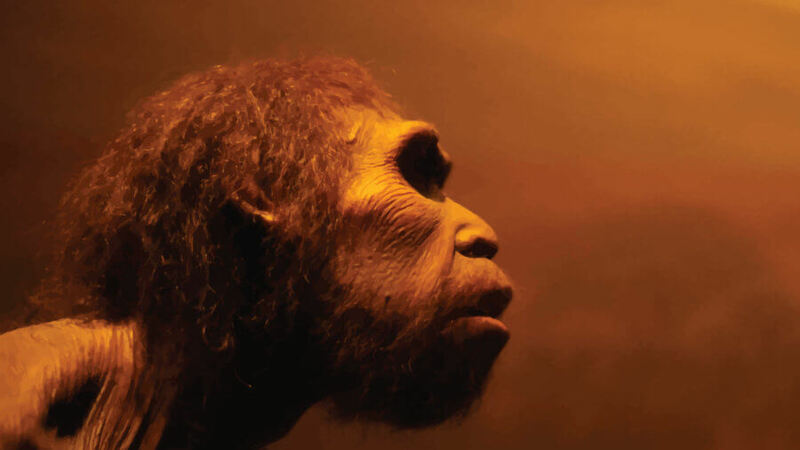 The plan isn’t to resurrect complete Neanderthal brains in a vat—rather, it’s to use gene editing to give human stem cells several gene variants found in Neanderthals. These edited stem cells are then coaxed into lentil-sized brain blobs that mimic fetal brain development, complete with their own blood vessels, neural networks, and functioning synapses. By comparing the growth of Neanderthalized mini-brains with that of a human brain, Pääbo hopes to tease out the genetic factors that make us so cognitively special. Paleontologists have long wondered how evolution crafted our spectacular brains. By comparing our genetics with that of our close ape cousins, geneticists have painstakingly teased out a handful of critically different genes. Slight mutations to FOXP2, for example, seem to underlie our ability to form complex phonemes and words. Some even argue that FOXP2 is a key biological beneficiary that enables our rich, colorful language. Unfortunately, comparing genomes can only pinpoint genes that are different between humans and apes—how these genes shaped our brain development has remained relatively mysterious. Now, thanks to increasingly sophisticated DNA technologies, that’s set to change. Roughly three decades ago, Pääbo began earnestly considering a radical idea: can DNA be extracted from dead tissue? Although DNA is relatively stable compared to other biomolecules, such as proteins, it begins to rapidly decay following death. The famous double helix, carefully wound by nature into compact structures, breaks down into increasingly shorter fragments with time. Piecing the tidbits back together is a terrifyingly complex task—but in 1985, using the remains of a 2,400-year-old mummy, Pääbo convincingly showed that it could be done. The discovery blew the field of paleontology wide open. Scientists were no longer stuck with comparing DNA from modern, closely-related living species; rather, they now had a powerful tool to go back in time and examine DNA lost to history. Galvanized by this initial success, Pääbo turned to Neanderthals, a mysterious branch of humans extinct for more than 30,000 years. In 2016, he unveiled the first complete Neanderthal genome, shocking researchers and the public with an intriguing result: about one to six percent of Neanderthal genes overlapped with those of people from Europe, the Middle East, and Far East regions. In other words, at some point in ancient history, our ancestors danced the horizontal tango with their Neanderthal cousins—and we are proof of those trysts. “Neanderthals had contributed DNA to people living today. It was amazingly cool. Neanderthals were not totally extinct,” he gushed at the time. Pääbo’s discovery naturally led to a broader question: what exactly is the relationship of the Neanderthals to us? Similar to modern humans, the heavy-browed, cave-dwelling hominims painted artwork, crafted headdresses, and adorned their bodies with colors long before modern humans set foot in Europe. Yet they went extinct, whereas humans proliferated into billions and spread across the entire globe. By comparing our genomes, Pääbo’s group has already identified a handful of regions containing DNA variations—changes that might have helped humans adapt. Among these are genomic regions that play a role in cognitive development. While our wildly different fates may not be entirely due to differences in cognition, Pääbo believes it’s a good place to start. And thanks to brain organoids, he may have a way to test the idea. Brain organoids have many names: cerebral spheres, mini-brains, or cerebral organoids. First concocted in 2013, these freakish brain blobs look straight out of an 80s horror flick. But because their growth parallels the development of a human fetal brain, the lentil-sized blobs rapidly became a neuroscience darling. The recipes for cooking up brain organoids are many, but generally they start their lives as human stem cells. Under careful supervision, cells slowly develop into misshapen chunks of brain tissue with the help of a chemical soup. Similar to an actual human brain, these blobs develop distinctive structures and regions. For example, most blobs contain a structure similar to the cerebral cortex, the wrinkled outermost layer of the brain that orchestrates high-level cognitive functions such as attention, language, and thought. Given enough time, neurons inside the blobs spontaneously spark with electrical activity and hook up into neural networks, with some connections reaching as far as the entire organoid. Brain blobs are not “mini-brains” in the sense that they can’t yet think or feel. But careful analysis of their cellular inhabitants and gene expression revealed a variety of functional neuronal types, strung together in a way that resembles a second-trimester fetal brain. In other words: brain balls are the perfect candidates for studying brain development. Since their inception, brain blobs have been used to mimic autism, schizophrenia, and examine the effects of the Zika virus on the fetal brain. Now, thanks to Pääbo, they’re about to stride into paleontology. To recapitulate an entire Neanderthal genome, scientists would have to tweak over a million genes. This ambitious goal is currently impossible even with sophisticated genome editing tools like CRISPR. Instead of brute-force editing all Neanderthal variants into human stem cells, Pääbo is taking a more nuanced approach: introduce just three key genes notably different between humans and Neanderthals, and then track the effect of these genes on brain development. A few years ago, working with Dr. Wieland Huttner, a developmental neuroscientist at the Max Planck Institute of Molecular Cell Biology and Genetics, the team grew brain organoids using white blood cells from humans and other apes. The brain blobs developed for weeks, allowing sufficient time to compare and contrast how their cells grow or hook up differently between species. For example, using live microscopy, the team surprisingly found that human cells took roughly 50 percent longer than ape cells to arrange their chromosomes before dividing into daughter cells. And somehow, this lengthening seemed to help humans generate far more neural stem cells than our closest ape cousins. Pääbo is hoping to find such stark differences in Neanderthal brain blobs that could explain why modern humans won out as a species. Even if these genes are not the answer, Pääbo—and the world of paleontology—will have an incredibly powerful new paradigm in hand.